As suggested by both their common and scientific names (Mellivora capensis means "honey eater of the Cape"), honey badgers have always been associated with bees. Apart from man, they are the most destructive mammalian predators of honeybees in Africa and they can and do cause substantial losses to both traditional and commercial beekeepers. While honey is not a necessary part of a honey badger's diet, the highly nutritious bee brood is a sought after delicacy. and this brings them into conflict with beekeepers. 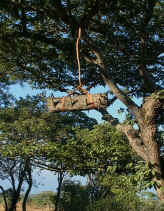 Throughout Africa, where badgers still occur, traditional beekeepers hang their bark hives from trees to minimize damage from badgers as they have done for generations. While traditional beekeepers are remarkably fatalistic about the 2 –7 % of hives they still lose to badgers each season, commercial beekeepers are less able to support this level of loss. Jonathan Kingdon in his treatise on East African Mammals (1989) showed that despite the precautions taken by traditional beekeepers 2700 hives from a total of 24 000 in Tanzania were damaged by badgers in a single year, and concluded that “modern apiculture is less prepared to lose 10% or more of its production to these animals.” Reports of badgers raiding apiaries have been recorded from South Africa, Botswana, Angola, Zimbabwe, Malawi, Mozambique, Tanzania, Zaire, Kenya, Uganda, Senegal, Togo-Benin, Nigeria, Ethiopia and Somalia (Hepburn & Radloff 1998). 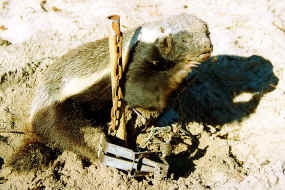 A survey of the beekeeper –badger conflict in Western Cape Province in South Africa, completed in 2001 by K. Begg, revealed that honey badgers were causing direct losses exceeding R500 000 ($62 500) annually in this area alone. More than 80 % of beekeepers surveyed revealed that they had experienced problems from badgers and more than half admitted to killing them. Predictably, hives were most frequently damaged by badgers in areas where they are placed on the ground in indigenous vegetation that supports both good bee forage (flowering plants) and healthy populations of badgers. To ensure effective conservation of honey badger it is crucial that more beekeepers adopt these "badger-friendly" practices as part and parcel of their profession, particularly when their hives are placed in indigenous vegetation and on the borders of protected areas.